Rock Climbing Wall with safety plus! (auto belay hydraulic system that secures climbers and trained operators who work with climbers in doing the best that they can do.) 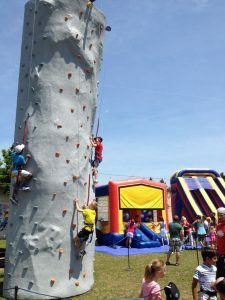 There are 3 climbing stations which present easy, medium and difficult terrains. Scouting Youth can count this activity towards their Vertical Skills 2 badge. Big Bouncy with large interior jumping area and more. Screens allow spectators to watch the fun. Smaller Bouncy for little ones. Lawn games and bubbles for all ages. best of all! – great food! Time: 3:30 – 6:00 p.m.
You might want to bring along a blanket and/lawn chairs to sit and eat on. Please sign up here to indicate where you could help with the events of the day.